The manuscript of KLIFS v1.0 was just accepted as a perspective in the ACS journal of Medicinal Chemistry (link to the manuscript). Therefore the full KLIFS v1.0 database is now available for download on this website (here). Explore the kinase-ligand interaction space by browsing through 1734 crystal structures of human kinases (with a kinase domain) covering 190 different kinases. All structures are structurally aligned in a consistent manner, 85 pocket residues are extracted and each of the interactions with the co-crystallized ligands are encoded into IFP fingerprints. 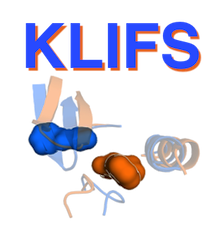 We continue working on the second version of KLIFS, which will contain a fully-operational web site with integrated search options to navigate your Kinase-Ligand space!